The second oldest national park in Croatia, Paklenica National Park, has a unique mountain scenery: canyons up to 700 m high, hidden coves and caves, green oak, pine and horn beam trees, as well as streams and waterfalls. 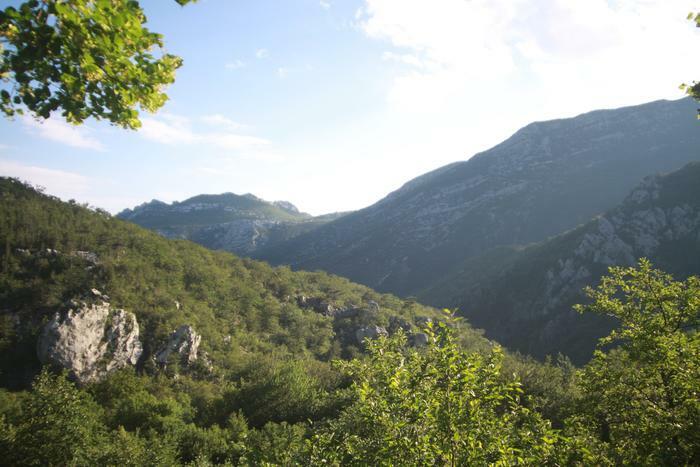 That is why Paklenica National Park is an ideal location for all nature and hiking lovers. Keep on reading to find out what to see and do on your visit to one of the most beautiful national parks in Croatia. How to get to Paklenica National Park? Paklenica National Park is located in North Dalmatia, an hour away from the city of Zadar by car. If you're coming from Zagreb, you can take the A1 highway, take the exit at Maslenica and then the state road toward Rijeka for about 15 km. You can get to Starigrad Paklenica form Zadar (it's a 50 minute ride). If you're coming from Zagreb by bus, you need to get to Zadar first, and then take a bus to Paklenica. If you're in Rijeka or Split, you can also get to Paklenica from there. Parking at the park's entrance costs 10 kunas (1.35€). There are two entrances. The main entrance is located in Velika Paklenica and the other one is in Mala Paklenica. Off season, the ticket costs 40 kunas (5€), while the price is 50 kunas (6 €) in high season. Keep in mind that the park can change the prices, so always check the official website beforehand. The best time to visit Paklenica National Park? The best time to visit Paklenica National Park is early spring and late summer, if you don't like the heat. On the other hand, Paklenica is full of forests that provide shade and protection from heat during summer months. Remember to contact management if you're planning on visiting some parts of Paklenica National Park, such as Manita cave, off season (from 1 November to 1 April). Paklenica National Park is a haven for those who love walking around in the nature. Experience the rough beauty of mountain scenery around you. On your walks, you can encounter various animals like bears, wolves, lynxes, and wild cats. If you're not in shape for longer trails, we recommend the Velika Paklenica trail (550 m long) leading to a renovated mill and Paklarić lookout. One of the most popular trails also connects Velika Paklenica with the mountain hut. If you take this trail, you'll see the mills of Paklenica, the canyon of Velika Paklenica, little waterfalls and the popular climbing rock Anića kuk. The trail is marked with 10 info boards explaining parts of the trail. If you're longing for a true hiking experience and you are an experienced hiker, we recommend hiking to the top of Velebit, to its peak Vaganski vrh (1757 m). You can hike to a bit lower but not less demanding peaks like Sveto Brdo (1751 m) and Vrh Liburnije (1709 m). When you get to Vrh Liburnije, take your camera out and capture a truly magnificent scene of the Mid-Adriatic archipelago. This international bat manifestation has been taking place since 1997. Bats reside at Paklenica National Park so it is the ideal place to study them. The manifestation includes workshops for children, educational lectures on bats and an exciting search for them with the help of bat detectors. Bat detectors are ultrasound detectors which enable people to hear their frequencies. This manifestation is held at the end of every year. One more manifestation that is held at Paklenica National park every April is the International Climbers Meeting. This event includes a number of connected events for people of all ages, from competitions to climbing courses. Those couple of days are characterized by a competition in speed climbing, a climbing marathon from dawn till dusk, kids climbing competition and top rope climbing school for kids and adults. Where to stay near Paklenica National Park? • Prepare and check your equipment in advance. • Bring a lot of water with you (especially during summer). • Bring your first aid kit. • Take only those trails you are fit enough to take and familiar with. • Do not go hiking alone and at night. • Inform somebody when you leave and give them an estimated time of return from your hike. • It is forbidden to throw or leave waste in nature – respect nature. • It is forbidden to camp in Paklenica National Park. • It is forbidden to hunt in Paklenica National Park. • It is forbidden to start open fires and throw cigarette buds around.